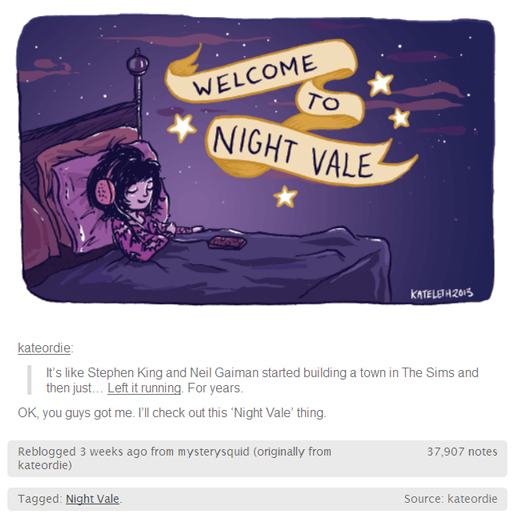 That’s not Night Vale, that’s just one of the incredible fanworks created for Night Vale. People are trying to manufacture viral marketing left, right, and centre, but you can’t bottle what Night Vale has got. I’ve seen Tumblr fandoms create audiences before – I’m not the only person who got into Hannibal because I Just. Couldn’t. Resist. The. Memes. Anymore. But Night Vale? Night Vale is something else. Maybe it was the bumper stickers (right). I think they were the first Night Vale art I saw on Tumblr, and they are actually official merchandise, unlike the vast majority of Night Vale art you’ll find on the Internet. These are the bumper stickers created by the local branch of the NRA in Night Vale. I saw these for the first time maybe three weeks ago – no more than four. And since then Tumblr has basically exploded with fanworks. If you’re on Tumblr and you’re not seeing at least a couple of Night Vale fanworks every day, then you are following the wrong people. I’d say it’s more like if Veridian Dynamics ran the radio station in a town designed by H P Lovecraft and Douglas Adams, but you get the overall sense. What it actually is is a podcast, written by Joseph Fink, as the broadcasts of ‘Welcome to Night Vale’, a radio show hosted by Cecil Baldwin, with local news and weather for the small desert town of Night Vale. 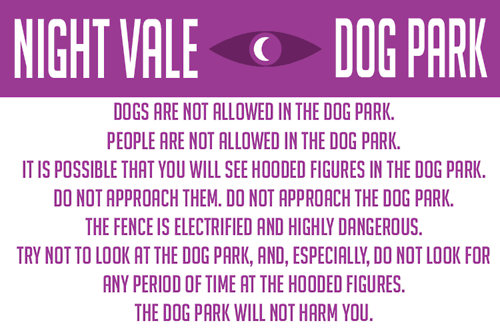 Night Vale is a strange place, with local amenities such as the Dog Park – DO NOT THINK ABOUT THE DOG PARK – the waterfront (there is no water at the waterfront), the library (peopled by terrifying Librarians), and Night Vale Community College. The residents seem mostly human, although there was an outbreak of people growing extra eyes, which has led many fans to picture Cecil with a third eye (although there is no indication in the show itself that he has one). There also seem to be some angels, who hang out with Old Woman Josie, although the Town Council has advised that angels do not exist and it is illegal to know anything about the hierarchy of angels. There’s a neighbouring town of Desert Bluffs, with which there seems to be some rivalry, and which, if anything, seems even stranger and more terrifying, although it makes a more concerted effort to affect that everything is normal and FINE. And there is Carlos. Perfect Carlos. With his Perfect Hair. 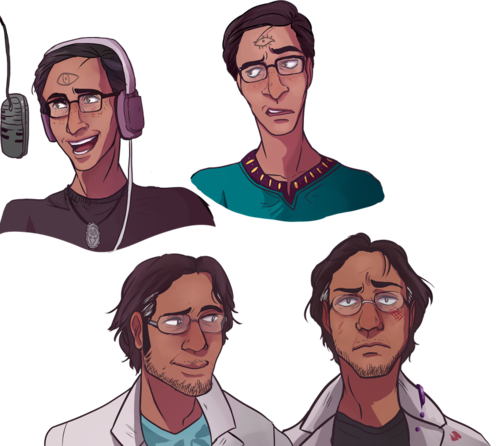 Carlos is a scientist who comes to Night Vale as a stranger in the first episode, to study the town and its unusual properties. Like the fact that the sun sets at the wrong time, and seismic activity is being recorded, but no earthquakes are felt. 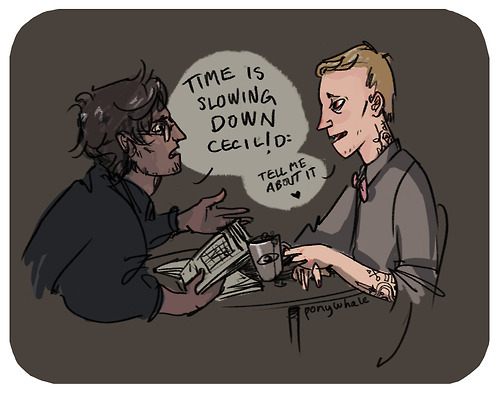 Cecil is in love with Carlos, and his Perfect Hair. And Cecil’s love for Carlos might be the sweetest and most heart-warming thing I have ever listened to. Listening to the podcast itself is a pleasure. It’s just like listening to a radio show, which makes it easy to digest. Unlike podcasts which tell a story, you can drift in and out and not worry about losing the thread of plot. There is plot, but it evolves slowly. Typically there is some specific event which forms the backbone of the specific episode, but there are also longer arcs, like Cecil’s love for Carlos, and what exactly is going on with the man in the tan jacket, or time slowing down, which evolve more slowly. Perfect listening fodder for walking to work or going on long car journeys. Moreover, Night Vale is wonderfully inclusive. It directly calls out racism via the character of the Apach e Tracker, a white man who dresses up in what Cecil describes as an ‘offensively racist’ costume and talks about ‘ancient indian magics’. In a world where most white people still do not realise how problematic the appropriation of other cultures (like Native American culture) is, it’s refreshing to hear stuff like this called out directly. And this continues on into the fandom, where many artists delight in imagining a less white-dominant cast for Night Vale. As in the video above, where Pamela Winchell is imagined to be played by Gina Torres, Cecil by Richard Ayoade, Old Woman Jose by Loretta Devine, Grace Park as Cactus June. Or in other images where Cecil is imagined as Indian or Native American. A lot of fans really seem to enjoy the fact that no direct race has been indicated for Cecil, and it is therefore entirely open to fan headcanon. Not that there hasn’t been some controversy over this. Many Tumblrites are annoyed that so many people default to seeing a white Cecil despite the opportunity to imagine something different. Whilst I do think it’s great that lots of people have imagined Cecil as something other than white, I do also get why people are frustrated with there not being more. It’s kinda a hella fraught issue, so I won’t venture any more opinions on the matter than that. As a white woman I’m aware that my privilege may be affecting my impressions. Whatever your view on the matter, Night Vale itself seems pretty progressive. For a while I was frustrated that there were so few female characters. However, as time has gone on, the cast has become much more varied, and I’m less concerned on that front. Yes, it’s annoying that the protagonist is yet another man, and Carlos, as chief secondary character, is also a man; but I love that they have a gay relationship as the love story with absolutely no sense that there’s anything unusual about another man being the object of Cecil’s affections, so I don’t feel like I can complain too much on that front. I also love the Weather section. The ‘Weather’ to be clear, is always a piece of music, and not an actual weather report. The styles of music presented are incredibly varied. I can’t say that I like all of them, but I have been introduced to a whole bunch of stuff I would never have listened to otherwise and which I am now thinking about buying. How cool is that? Not that there’s anything new about having a random music section in a comedy show. The Young Ones included a musical segment, and other hip young shows have done so since. There seems to be a general tendency for scrappy alternative programmes to support other scrappy enterprises, and I imagine there’s a fair amount of overlap in musical and comedy circuits simply due to the performance aspect. In any case: it’s cool, it’s great, I enjoy it. 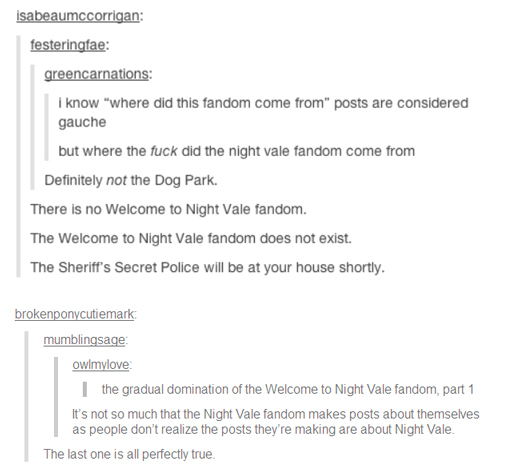 Get on board the Night Vale train, ladies, gents, and others. You won’t be sorry. Welcome to Night Vale can be downloaded from iTunes, podbay, Stitcher or Libsyn or Feedburner or Soundcloud. It is produced by Common Place Books, and has exciting merchandise available from Topatoco. And it’s entirely free. This entry was posted in Night Vale, Review and tagged Carlos, Cecil Baldwin, comedy, Night Vale, podcast, podcasts, review, weird. Bookmark the permalink. And this weekend’s episode will feature Intern Dana! I think I’ll be ordering a tshirt.